What makes a good sequel? Or to put it another way, when you’ve written Chains, a book short listed for the 2010 Carnegie, how do you top that? Forge is not just a sequel; it’s the second volume of Laurie Halse Anderson’s trilogy about the lives of two young slaves caught up in the American War of Independence. 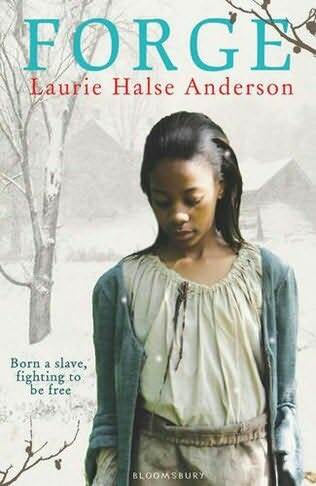 Chains was Isabel’s tale; in Forge the story is taken up by Curzon Smith, slave turned soldier, whom Isabel befriended and rescued from prison at the end of the first book. Puzzling then that the UK publisher decided on a cover photo of 'Isabel'. After their escape from New York, Curzon and Isabel have parted company on bad terms, Isabel doggedly going in search of her little sister Ruth from whom she has been cruelly separated. Irritated with Isabel but at the same time struggling to suppress his feelings for her, Curzon rejoins the rebel cause as they prepare for battle against the British at Saratoga. After a hard won victory, the Patriot army moves on to Valley Forge as the severest of winters tightens its grip on the north. Forge is a story of battles, severe hardship and a starving winter and Anderson’s vivid prose puts you right at the heart of the action. Curzon’s voice is distinctive and despite the grim subject matter, often humorous. But the reader is never allowed to forget how precarious his position is. Soldier he may be, fighting on the winning side for the freedom of the American states, but the question of his own independence is another matter. African Americans fought for both sides in the war but the Patriot declaration that ‘all men are created equal’ did not extend to people of colour when it was written in 1776. Readers may be surprised to learn that it was the British alone who promised freedom to slaves who joined their cause. Curzon and Isabel eventually meet up again as recaptured slaves in the same household. There they encounter a dangerous new enemy and have to decide whether to join forces in a bid for freedom or to go their separate ways. Read as a sequel, Forge delivers on every score. It keeps up the pace of Chains, maintains the reader’s interest and resolves at least some of the issues arising in the first book. But if, like me, you start it wondering whether Isabel manages to catch up with her little sister . . . well, you’re just going to have to read the book! Hadn't come across this, Sue, and it sounds really good. Thanks! It is Sue! Can't wait for the final volume, Ashes, which doesn't have a UK publication date yet. Great book, can't wait for next book in series to come out!